Preservation of Community Assets: Blogger Candidate Forum: "Bowling Alone"
It is that time of the week for Blogger Candidate Forum. Before we get going on today's subject, Blogger would like give a shout out to the directionally challenged Commander-in-Chief President Donald Trump. President Trump bragged bigly about a "armada" of American naval vessel headed toward North Korea. Only one problem, the aircraft carrier Carl Vinson, part of the armada, was headed in the opposite direction, toward Australia. Oops. Next time try using Google maps. Shall we move on. President Trump's first hundred days in office are coming to a close and yours truly thought it would be a good time to look at how detachment from community played a role in POTUS's election. 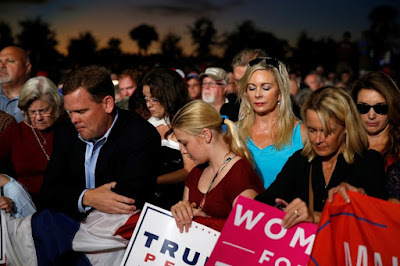 Emma Green considers in her CityLab article, "The Death of Community and the Rise of Trump," how decreasing affiliations with religious and civic institutions in predominantly Caucasian working-class America mean for its political future. Ms. Green writes, "In 2016, 57 percent of white Americans who voted chose Donald Trump over Hillary Clinton,...More white men voted for Trump than women. A plurality of young white people vote Trump, as did roughly two-thirds of white people without college degrees." While these numbers break down the Election into a simple story of race and partisanship, they ignore the demographic shifts among Caucasian voters that will have a major impact in future elections. What is being ignored is Caucasian Americans, in particular young working class Americans, are becoming detached from religious and civic institutions. Despite a fresh burst of energy from the special election in Georgia's sixth districts, both Democrats and Republicans must contend with their demographic futures. After a devastating defeat in November, progressives are struggling with how to reach out to Caucasian voters who cost them the election. 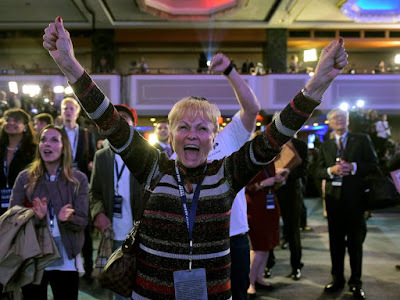 The victorious conservatives must look ahead: "Their success largely depends on a shrinking share of voters who are becoming more disillusioned with and detached from political and communal life." While these detachment matters for elections, it also has impact on American culture: "It's a small sign that the nation's cultural and civic fabric is fraying." 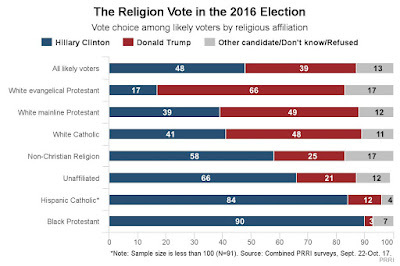 "The Religion Vote in the 2016"
Overall, white Americans are significantly more likely to be disconnected from religion than...non-white Americans...They are 2.5 times more likely to say that seldom or never attend religious services and nearly twice (1.7 times) as likely to identify as religiously unaffiliated. Emma Green observes, "What's interesting is that this might have a class component." In October 2016, PRRI and The Atlantic conducted a study on Caucasian working class voters, who were so fundamental to POTUS's victory in the typically Blue States of Michigan and Pennsylvania. (http://www.nytimes.com; date accessed Apr. 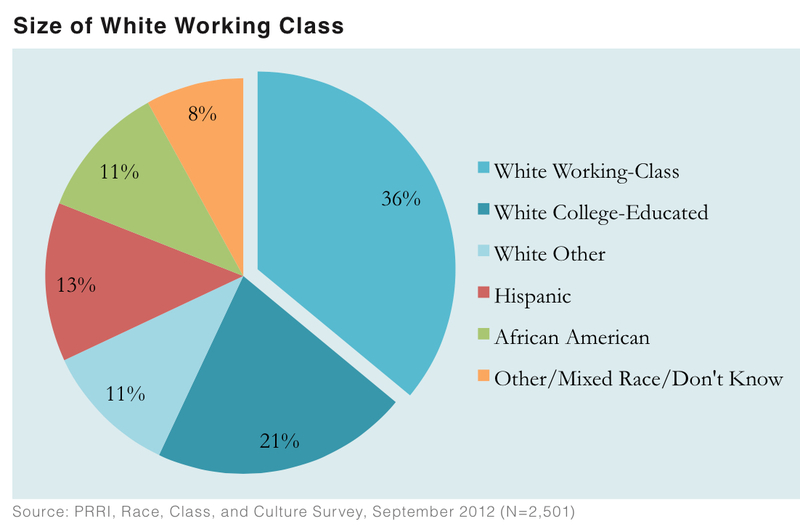 19, 2017) Unlike some pollsters, "they defined 'working class' as people without a college degree who also paid by the hour or the job, meaning white-collar workers were excluded." 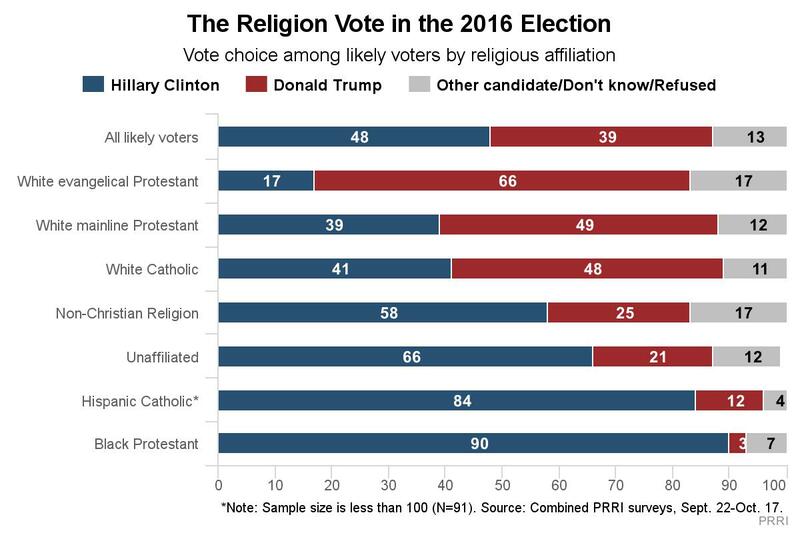 "Vote Choice in the 2016 Election"
Compared to their college educated counterparts, working-class Americans are less likely to attend religious services. People in their late thirties and forties "...seldom or never go, compared to less than a third of college-educated people in that age group." 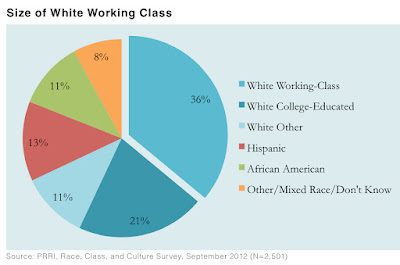 Overall, Caucasians under thirty-five are unlikely to regular worshippers: "Nearly half of both the working class and the college-educated said the rarely or never attend services." 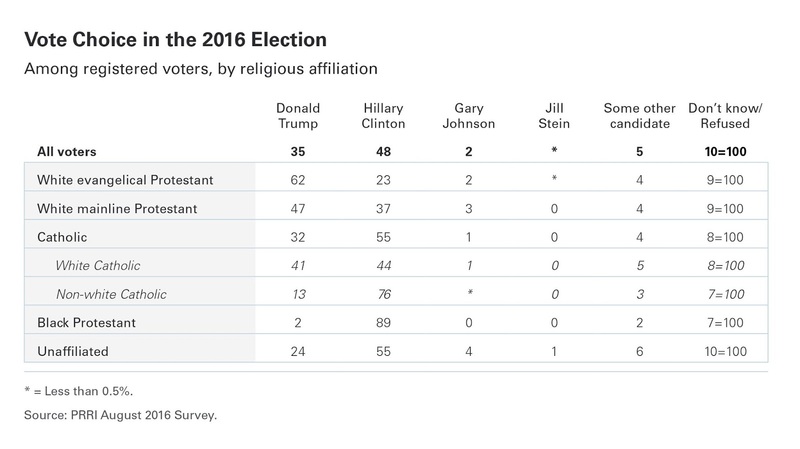 Alternatively, young, well educated Caucasian people maintain that they are religious as well: "Only 31 percent of this group said they're not affiliated with any particular faith, while 43 percent of young, white working-class people said the said." They're going to be missing one of the major pipelines toward voting and civic population...Churches have served, for most of the nation's life, as pipelines to all kinds of civic engagement-and not because they hand out voter-registration cards or has them in the lobby. We actually see a link between all kinds of civic activity and church activity. 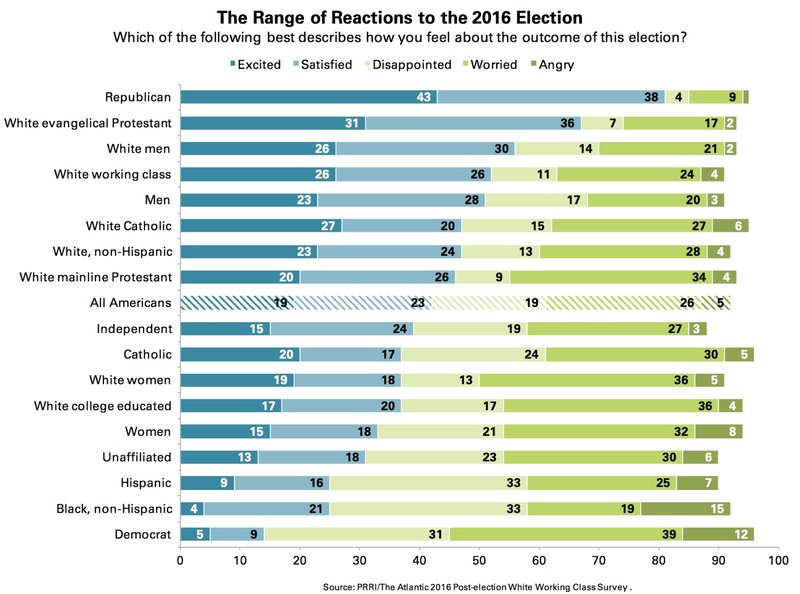 "The Range of Reactions to the 2016 Election"
"including everything from voting in elections to being involved in community groups." 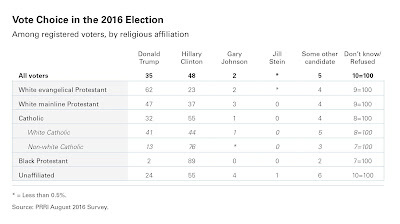 The parties are increasingly divided by race and religion. The Democrats and Republicans must wrestle with the implications of these changes in American demographic, this includes an increasing number of non-white citizens and an aging Caucasian generation that was once more active in religious and civic life, by default. My biggest fear is that we do end up with these two parties: One that represents an aging white Christian America, and that's resentful as it's losing ground, and one that represents a growing demographic but also its own kind of resentment,...Both parties give up on telling a story about the country that everybody can see themselves in. So we have these two mutually exclusive stories about what it means to be in American. Together with decreasing participation in common civic and religious institutions may produce a sense of alienation and grievance. Here, elements like wealth and class might play a part in how detached Americans are from civic life: "Research shows (http://www.npr.org; date accessed Apr. 19, 2017) that are less likely to vote (http://www.theatlantic.com; date accessed Apr. 19, 2017), for example." However, race appears to an important element of the gravitational force described by Mr. Jones. 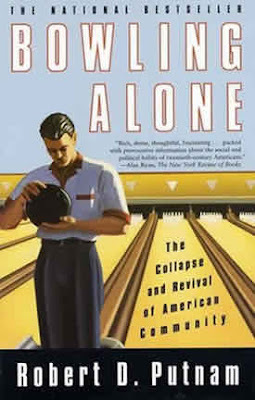 An increasing number of Caucasian American are "bowling alone," disengaging from the social network of civic and religious life that has forever defined American political culture.